He was thinking, I hope this doesn’t turn out to be one of those Reader’s Digest disaster stories where people read how I survived the Coppermine. If I survive. Feeling slightly nauseous and more than slightly nervous, he was looking out the small window of the Twin Otter at a silvery band of water winding through the tundra as the pilot circled descending to a wide flat spot in the river to land. I hope he’s done this before, he thought, since the two wilderness guides, Paul and Karen, had admitted to him the previous evening that they had never done this trip before themselves. Daniel still found that worrisome. Then he met the other paddlers and discovered that only two of them had any prior wilderness paddling experience. 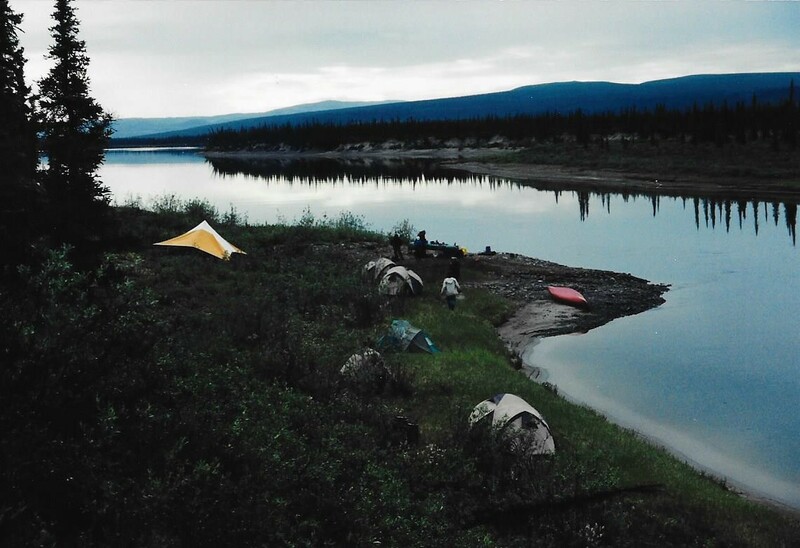 The True North Adventures brochure had not exactly advertised inexperienced guides leading inexperienced paddlers down the historic Coppermine River. He would also learn in a few days that the brochure description of a leisurely float down the river while gazing at the fascinating Nunavut landscape and wildlife was slightly over-stated. The rapids, however, would turn out to be even more exciting than advertised. The flight from Yellowknife had been an awkward start. Crowded and stuffy with six passengers and three canoes inside the small twin-engine plane, he squeezed uncomfortably under one of the canoes as they rolled and bumped north for three hours. The pilot had apologized for cramming the canoes inside and taking up most of the space. OK, good choice. But they had not yet found an easy way to get them into the narrow cabin, which was designed for only twelve passengers and limited cargo. 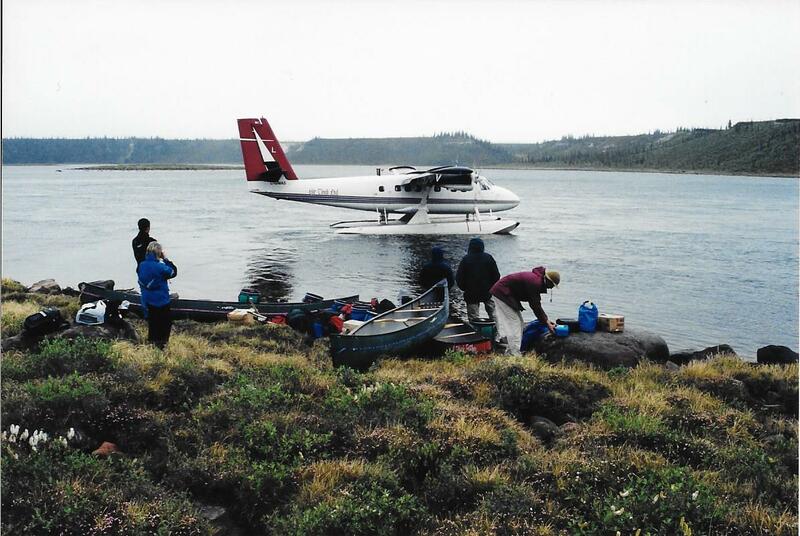 After removing some seats, grunting, twisting and cursing they were able to force the canoes into the plane from the dock and prepare to take-off from Great Slave Lake. 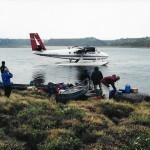 Getting them out again after they had landed on the river and taxied to shore was easier, but Daniel was suddenly aware of just how far from civilization they were as the plane roared away and lifted off the water heading back south to Yellowknife. Paul saw him gazing after the plane and said, “Don’t worry, Daniel, we have a satellite phone to call him back if we have to.” Then added with a grin, “If it works, when we need it.” All very reassuring. Daniel looked around at the two guides and three other paddlers, put on a determined façade and said, “OK, let the games begin!” The others feigned similar enthusiasm as they hauled their gear and supplies from the shore to a flat sandbar nearby and tried to fend off the nagging swarms of mosquitoes and blackflies. Their immediate priority was to dig out the insect repellant and protective netting to pull on over heads, hands and feet. It soon became standard practice to cover up whenever they were not on the river. After pitching their tents, Paul and Karen lead them in the canoes to the junction of the White Sandy River for a refresher on canoeing technique and testing paddlers in different pairs. Daniel was one of only four guests in the group for this trip, as several Americans had cancelled at the last minute, so they were well served by the two guides, Paul and Karen, married teachers from Ottawa with a lot of wilderness canoe experience including several long-distance trips together in Northern Québec. They learned later that Karen was actually pregnant during the trip and probably should have spent a more tranquil two weeks at home. Daniel had been introduced to the others at the hotel in Yellowknife during the pre-departure briefing session where he had learned it was a first trip down the Coppermine for their two guides. “You should have seen the look on your face when we told you that,” said Paul later, but it seemed reasonable to Daniel to be a little concerned. After the briefing session, they all walked in to the historic old town of Yellowknife and had dinner at the recently restored Wild Cat Café. The soaked up the Klondike prospector atmosphere with Yukon beer, muskox steak, and local musicians playing on the corner stage and enjoyed the opportunity to get acquainted. They exchanged backgrounds and their canoeing experience. Daniel admitted he had only done a couple of fast-water canoe trips with his brother in the Laurentians north of Montreal, but he had taken a three week course that summer to improve on his skills before the Coppermine. He had also studied the classic, “Path of the Paddle” by Canada’s most famous whitewater paddler, Bill Mason, which was stowed in his pack for future reference. He did not admit that the canoe training had been on the flat water of Lac St. Louis in Montreal, nor that even after he had completed the course, he was still not good enough to keep the canoe upright in the waves and had accidently dumped his daughter and grandson into the lake on a short paddle along the shore. The other inexperienced paddler was Susan, a petite shy blonde from Toronto, who had only occasionally paddled around the calm lakes of the Muskoka region in Ontario. This was a first wilderness adventure for her, but she was determined to use it as a break from her hectic and frequently traumatic work as an emergency room nurse at Toronto General Hospital. The two more experienced paddlers were Werner from Munich and Rob from Winnipeg. Both had done previous whitewater trips, but interestingly, it was the German who knew the rivers and geography of the Canadian North better than any of them. Both Werner and Rob were strong and lean and clearly comfortable with wilderness camping and canoeing. Werner had a ready smile with deep lines on his tanned face under reddish brown curls. A dedicated traveler with good vacation time-off from his work in European sales for a specialty chemicals company, he enjoyed his winter vacations in Spain or the Canary Islands and his summer adventure tours in the remote regions of North or South America. His girlfriend enjoyed the winter destinations with him, but stayed home for his summer excursions. Rob was a tall, balding systems-analyst for a school board and looked very much the computer geek with his slumping long thin body and steel rimmed glasses. No mention of a girl-friend, maybe hoping for a summer romance. Susan might actually be a good match. Might be worth watching, Daniel was thinking, as he contemplated his group of travelling companions. Daniel was the only grandfather in the group, the others were all in their thirty’s and forty’s. Recently retired, he had decided this would be his voyageur experience in a tribute to his French-Canadian heritage. He was still trying to adapt to his new retirement life style and seeking new challenges and pastimes. His wife, Sylvie, was happy to have him away for a while, as they had not yet become fully comfortable with him being at home so much. As they sat around the campfire in the daylight that lasted until after eleven at night, the guides reminded them of the ground rules to keep everyone safe and to respect and protect the fragile northern environment. “Take only photographs and leave nothing but footprints.” After meals, the routine was to clean up without any waste going into the river, then re-pack the garbage and empty containers to carry them out. For the toilet routine, it was wipe, burn and bury it. Paul traced their route down the river on the map. “We start here about 350 kilometers from Kugluktuk and we have thirteen days to get there.” The Coppermine River flows across the North West Territories and Nunavut for about 850 kilometers from its source at Lac de Gras through the tundra and barren lands to inside the Arctic Circle then on to Kugluktuk where it spreads into the meandering channels of the delta on Coronation Gulf and flows into the Arctic Ocean. Later that evening as they sat together around the campfire, Paul told them more about Samuel Hearne, the first white explorer to descend the Coppermine River, and the massacre at Bloody Falls on July 17th, 1771. Hearne was an adventurous Englishman who had left school at age eleven to join the British Royal Navy. After battle experience in Europe, he decided to join the fur trade in Canada with the Company of Adventurers on Hudson’s Bay in 1766. 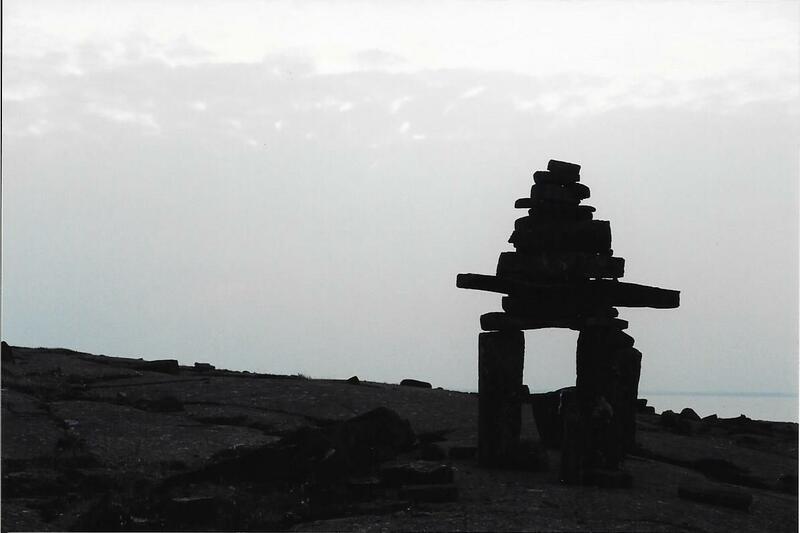 He served the Hudson’s Bay Company on several ships out of Fort Prince of Wales surveying the coasts before he was chosen by the Company to explore the territories for the source of the copper that both Dene and Inuit native fur traders had brought with them to the trading posts. In 1769 and 1770, Hearne made two exploratory trips, on snowshoe in winter and by canoe in summer, mapping the vast expanses west of Hudson Bay to the Great Slave Lake. He had to survive the tundra and the risk of starvation when he and his crew were abandoned by the native guides on both expeditions. On his third expedition, Hearne was alone with a small group of Chipewyan Dene Indians and their leader Matonabbee. They remained together to travel across the territory and explore the length of the river he named Coppermine. He did observe copper outcroppings in some exposed rock faces along the river, but there has never been a discovery to justify a mining operation. There is now, however, a diamond mine in operation at Lac du Gras. 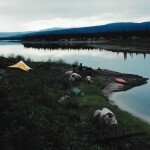 During that third expedition, as Hearne and the Dene descended the Coppermine and arrived at the last portage around the dangerous rapids just fifteen kilometers from the Arctic coast, the Dene scouts found a camp of Inuit near the river at the northern end of the portage. The Dene warriors, who were in constant conflict with the Inuit over hunting and fishing territories, used the cover of night the next day to attack the camp and brutally massacred twenty Inuit men, women and children. Hearne was horrified to observe the attack from the hilltop and noted in his journal, “… my features must have feelingly expressed how sincerely I was affected at the barbarous scene I then witnessed; even at this hour I cannot reflect on the transactions of that horrid day without shedding tears.” The site known as Kugluk to the Inuit was subsequently renamed by Hearne as Bloody Falls. It was a burden on his conscience for years afterwards that he had been unable to intervene and stop the carnage. Two hundred years later in 1996, the Inuit and Dene nations had a healing ceremony at the site of Bloody Falls to attempt reconciliation of their violent past. Pat’s stories of danger, violence and death on the Coppermine put a new perspective on their plans to paddle down the river. It was a night of uneasy sleep with those thoughts roaming their minds. The guides and their four guests were well equipped with gear and supplies provided by True North Adventures. They had four solo tents and a larger one for Paul and Karen. Paul was a creative cook on the campfire and satisfied all the healthy appetites after each day of paddling. Daniel had made the mistake of assuming it would be warm in Nunavut in mid-summer and had borrowed a light sleeping bag from his daughter. It might have been good for her African safari, but it was not sufficient for the Arctic, even in August. He borrowed an extra blanket to stay warm. The land of the midnight sun meant long sunny days, but it was never hot and often cold during the night. One night camped on another sandbar, Daniel woke to a pink sunrise at 1:30AM when he got up to pee, remembering the requirement to go at least thirty feet from the river. He decided to record the scene and take advantage of the light for a quick photo tour of the campsite. There was a sudden chill in the air, as he scanned the shoreline for any signs of life and backed up slowly towards the campsite. He wondered if there was any bear spray in the gear arranged under the upturned canoes on the beach. He lay awake listening for any wildlife, but fell asleep again until six in the morning when he was roused by the noise of cooking and talking from around the campfire. Paul was at the fire and pouring coffee for Karen. Daniel rolled out with the others and started taking down his tent and packing up for the day. He pointed out the grizzly print on the beach, but Paul and Karen told them not to worry. They took precautions to keep the food in sealed containers and well away from the tents. Bears were not likely to bother campers, they said. They did have pepper spray for anyone who wanted to go hiking away from the camp, but they would soon be north of the tree line and there would be no more bears. Maybe wolves. And far from any polar bears, until they got to the coast where they were also rare around Kugluktuk, apparently. Well, they did expect to see some northern wildlife, just not too close and personal, thought Daniel. In thirty minutes they were off paddling with nothing left behind except the wet black remains of the fire kicked into the sand. The first few days, the river was smooth and quiet and shallow enough in spots that they got out and walked the canoes through them. The first section of fast water, though, was enough to test their skills in some small rapids. Also the first scare for Daniel and Susan. Daniel was not good enough at steering from the stern and Susan was not strong enough at the bow for them to pull away from trouble in front. So suddenly they were sideways to the river on a standing wave and side-slipping over the rock beneath the surface. Susan panicked, shrieked, dropped her paddle into the canoe and held tight to the gunwales. Daniel’s eyes opened wide, but he clenched his jaw and remembering the tip from the first day, leaned the canoe downstream. The fast water immediately lifted it gently off the rock and they straightened out below the rapids and headed for shore, flushed with the thrill of avoiding a dunking. “Good job,” shouted Paul, “I thought you were going for a swim!” After pats on the back were exchanged, however, Paul re-organized the pairs. From that point on, Karen took the stern with Daniel in one canoe, Paul took Susan in his. Werner and Rob took turns at the stern and bow of the third canoe. Competence was more important than compatibility. Gradually they became used to the long days of paddling. On the river before six in the morning, they paddled for three to four hours, took a lunch break and relaxed for an hour or so on shore, then continued into the afternoon and evening before setting up camp. Some short sections of fast water and rapids of varying degrees helped to break up the monotony of stroke, pull, stroke, change hands, stroke, pull, stroke for hours on end. The scenery from the river was fascinating. Smooth rounded granite hills with sparse strips of stunted pine and spruce along the edges and willow and birch near the river as it wound its way north and west. Eventually the trees nearly disappeared and were replaced by smaller flowering bushes and streaks of rust and orange coloured lichen. Frequently the hillsides and cliffs were broken into piles of shattered rock and gravel from erosion and the passage of glaciers in millenniums past. From the canoes they did see some of the unique northern wildlife. A white wolf prowling the cliff top for rodents and bird nests as bald eagles circled above and a cow moose and calf along the shore feeding among the birch and willows. On shore for lunch before the rapids at Rocky Defile, they all watched a lone caribou approach the river and wondered why it would want to try crossing. Then they noticed it was being stalked by a big grey wolf. As the caribou entered the river and started swimming for the far shore the wolf turned away, but took a long look at the group on shore watching it. Feeling vulnerable as potential easy prey, they held their collective breath for a few seconds, until Paul said, “OK, let’s get back on the river. Those rapids suddenly look less dangerous than sitting here on the beach!” The broad grin suggested he was just teasing them all again, but it still seemed like a good idea. At another lunch stop, it was warm and sunny enough to go for a swim and float down the frigid river. Rob was the most enthusiastic as he laughed and splashed with vigorous strokes out into the stream and then floated on his back to climb out and do it again. The others took just a quick dip to rinse and cool off, but Daniel broke all the rules by taking in a bar of soap to remove the sweat and insect repellent from several days of paddling. Ah-h-h, the simple pleasures. It was not all easy paddling. On the fifth day there was a long and hard paddle across a lake and into the wind. White caps splashed over the canoe, fortunately kept from flooding by the spray covers installed before they started. It was exhausting for six hours. Then the rain started, so they rushed to shore and pitched tents in the rain. Another skill Daniel discovered he did not have; pitching a tent in the rain without getting the interior and the sleeping bag wet. How the Hell did I ever talk myself into this, he thought. Cold and exhausted, trying to sleep in a wet bag on a thin pad over river rocks, in the rain. Also not in the brochure. As the river flowed north out of the granite plateaus of the Canadian Shield into the rolling sandstone hills of Nunavut, there were stretches of fast water through narrow channels and more serious rapids. Rocky Defile was the most picturesque with high cliffs that they hiked before entering the rapids. It was a spectacular site from the clifftops sixty to a hundred feet above the river. Daniel hiked along the ridge with Werner to enjoy the view and get some memorable souvenir photos, but he did keep a wary eye on the bushes around them and the barren landscape stretching into the distance. No sign of predators or the rarely sighted musk ox. They descended from the hike, enjoyed a lunch and then ran the rapids without mishap. They were gaining confidence with each set of rapids and Muskox Rapids was a thrilling run as they went through the bigger waves instead of taking the easier fast water along the left bank. At each run, they followed the lead of Paul and Susan, Werner and Rob in the next canoe, then Daniel with Karen. It was an agonizing hurried search for Rob, but after an hour of looking on both shores in the few hundred yards directly below the rapids, Paul waved them back across the river to where Werner was shivering on the rocks and hugging his knees to his chest. “Look, Susan, you stay here with the canoe and build a campfire. Daniel, go with Werner up along the shore as close as you can to where they dumped and see if you can find Rob anywhere there. Karen and I will do another pass below the rapids, then look again along the other shore and come back here later. Let’s hope for the best. Rob is experienced in whitewater and knows what to do. He should be safe somewhere on shore. If not right here, then maybe he floated farther downstream.” His voice faded as he thought about that possibility. Unconscious or drowned, they might never find him. Daniel and Werner searched quickly along the shore towards the cliffs. The roaring rapids were even more intimidating at the edge of the cliff as the flow rushed over huge boulders. It looked like there was no safe exit from that spot. Werner must have been thrown out and over the rocks like a daredevil over Niagara Falls. Rob and the canoe must have done the same. The only chance of survival would have been to float out of the rapids and down the river. Held by the current underwater pinned to the rocks, he would have drowned in seconds and might be there a long time. They peered into the depths and at the few cavities carved into the rock wall, then accepting the obvious, they shared a distressed look and turned back to where they had left Susan building a camp fire. After getting the fire lit, Susan had decided to look for Rob further down the river in the opposite direction from Daniel and Werner. She had gone about five hundred yards when she came to another bend in the river that had a small back-eddy among the rocks, as it turned around the corner to the right again. There floating in the shallow water against the rocks, she saw Rob in his life jacket, face down and motionless. She stopped briefly in horror, then cried, “Rob!” and ran into the water. She pulled him to shore and turned him over. She then turned away at the sight of his shattered forehead and crushed eye socket where the blood oozed down his cheek. It didn’t take a nurse to know he was dead. It was a long sad night by the river. No one was ready to paddle any further that day. The next morning, Paul explained what was ahead. It would be a long day of paddling to Bloody Falls where they could camp overnight on the portage around the rapids. It might take more than a day for the two kilometer portage of all the gear and canoes, since they had one less helper and a body to carry. But then it was just a half-day paddle to Kugluktuk where they could finally get into a comfortable hotel if they wanted before dealing with the RCMP and the death of Rob. Not the celebration at the end of the trip that had been planned. The next day they arrived at the portage for Bloody Falls and started hauling the gear to the campsite. It was a quiet, picturesque sheltered sandy hollow among the rocks beside the roaring rapids. Quiet and picturesque, until they realized they were in the exact spot of the Bloody Falls massacre and they were camped there with a body wrapped near the fire that they would again have to take turns protecting all night. Not from marauding Indians, but from prowling predators that might be in the vicinity. The next day they continued in a solemn procession on the flat widening river, Paul alone with a body in the canoe, paddling with long, slow strokes into the Coppermine delta toward Kugluktuk. 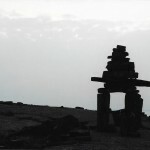 The small Inuit community came into view on the western-most channel of the river with a stark stone Inukshuk silhouetted on the rocky hillside above the town of small wood-frame buildings along the shore line. As they approached the dock near the centre of town, Paul thought about the True North Adventures souvenir gift packages stored away in the gear boxes, but decided they would not be distributed this trip.